Movements for human rights, including trade unions. The movement for human rights is an excellent precedent for the Global Movement for a Culture of Peace because it too is based on a normative document of the United Nations, the Universal Declaration of Human Rights (UDHR) adopted by the General Assembly in 1948. The document is all the more remarkable because many diplomats did not agree that human rights should include economic and social rights such as the right to housing, employment and healthcare, and they wanted to confine the Declaration to civil and political rights such as the right to vote and equal protection before the law. However, thanks to the insistence of the socialist states, backed by the newly joining UN members that had gained their freedom from colonialism, and thanks to the remarkable efforts of key diplomats such as Eleonor Roosevelt, the Declaration was expanded to include economic, social and cultural rights. Neverthless, to this day, the United States government has refused to accept these rights and sign the relevant protocols. 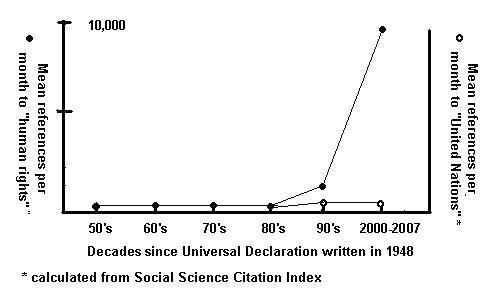 The graph shows the citations of human rights in academic publications as monitored by the Science Citation Index. For the first forty years the Declaration was rarely mentioned. It has only in recent years that references have exploded into thousands of times per year. "The primary aim of Amnesty International is to work to secure the release of people imprisoned for their opinions who have made no use of violence or incited others to do so. These prisoners are called "prisoners of conscience" . . ."
"What, one might ask, are the results of Amnesty International's activities during these last sixteen years? How many prisoners, for example, have been released as a result of Amnesty's efforts? Perhaps the best answer is provided by a single set of statistics covering the period 1972 to 1975, which reveals that of the approximately 6,000 prisoners for whom Amnesty was working at that time 3,000 were released. A great many factors, quite apart from Amnesty, may well have contributed to this result; nevertheless, these figures provide some indication of the scope of the work . . . It is still more important to consider Amnesty International's worldwide activities as an integral part in the incessant pressure exerted by all good forces on governments and on the United Nations Organisation, representing a coordinated and necessary effort to achieve an international society founded on justice." Now almost 60 years after its adoption, the Universal Declaration of Human Rights has been taken up by thousands of other organizations and struggles in all of the other social movements mentioned here as a powerful tool for justice. Hopefully, we will not have to wait so long for such effective use of the Declaration and Programme of Action on a Culture of Peace. It can be said that the most powerful movement for human rights over the past few centuries has been the trade union movement. Trade unions have fought consistently for such key rights as "a standard of living adequate for the health and well being of himself and of his family, including food, clothing, housing and medical care and necessary social services and the right to security in the event of unemployment, sickness, disability, old age or lack of livelihood in circumstances beyond his control." (Article 25 of the Universal Declaration of Human Rights), as well as the right to work, free choice of employment, and just and favorable conditions of work and protection against unemployment (Article 23) and the right to rest and leisure, including reasonable limitations of working hours and periodic holidays with pay (Article 24). Because the labor movement threatens the major profits of capitalist exploitation it has been met by the full force of internal military interventions. We have already mentioned the so-called "Industrial Wars" of the 1870's in the United States. Throughout the 20th Century the labor movement has been suppressed frequently by military force in country after country around the world, with the extreme case being that of fascist regimes where the labor movement has often been the first social movement to be brutally crushed. The labor movement in the North has been weakened in recent years by the flight of industrial enterprises into poor countries of the South where it has been easier for government-supported capital to suppress trade union organizing. This is an important cause of the growing gap in wealth between rich and poor countries as well as the gap between rich and poor populations within each country. The labor movement has provided important inputs into other social movements. For example, the great marches of the civil rights movement in the United States associated with Martin Luther King, Jr. were organized by trade union activists. And as shown in my book The American Peace Movements (1985), the peace movements attained their greatest strength when the labor movement joined forces with them. The close relationship between the labor movement and the socialist movement can play a major role in developing alternatives to the culture of war, if it is directed toward strengthening the participation of workers and trade unions in local governance linked with other social movements related to a culture of peace.